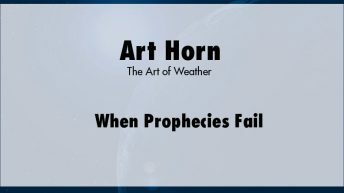 Art Horn, with 25 years of experience as a meteorologist for CBS and NBC television stations, now travels around New England, Florida, and other states with weather programs that educate and entertain. He hosted and co-produced a documentary about hurricanes on Connecticut Public Television, for which he was nominated for an Emmy. Horn is an expert witness for lawyers in weather-related legal matters. He also writes about global warming and publishes regularly in online magazines. In addition, Horn teaches meteorology at Naugatuck Valley Community College.